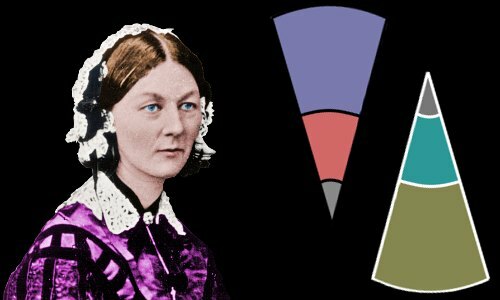 Immortalized as the lady with the lamp, Florence Nightingale was a highly intelligent, mathematically astute pioneer of better health outcomes. Her innovations resulted in lower death rates – first in hospitals, then in wider society. She formulated and implemented enormous reforms of nurse training and nursing practices. Before Nightingale’s reforms, nurses were seen as unhygienic and unreliable. Afterwards, they were seen as clean, medically trained, and well-disciplined. After experiencing first-hand the reluctance of people in government to change the way things were done, and realizing they were often too lazy to read reports, she started presenting statistics as pictures, popularizing the polar area diagram. Florence Nightingale was born on May 12, 1820 in the Italian city of Florence and named after that city. She was the daughter of a wealthy British couple who were enjoying an extended stay in Italy on their Grand Tour of classical Europe – a popular activity with the upper classes of that era. She had an older sister, Frances. Florence’s father, William Nightingale, was well educated and intellectually inclined. He had inherited great wealth from an uncle. Florence’s mother, Frances Smith, enjoyed a rather leisurely life. She also came from a very wealthy family background. 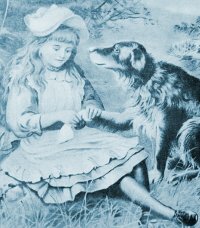 Florence Nightingale treats Captain, an injured dog. The family returned home when Florence was one year old, and she was brought up on family estates in England: in Embley and Lea Hurst. She and her sister loved exploring the countryside, and Florence kept a written record of the flowers she observed. She loved cats and had many pets including a pig, a donkey, and a pony. Later in life she would say pets make excellent companions for people suffering from chronic illnesses. Florence’s father home-schooled his daughters to an extremely high standard, reproducing the education he had received at the University of Cambridge, teaching them French, German, Italian, Greek, Latin, Philosophy, and Mathematics. Florence was a polymath with exceptional skills – Benjamin Jowett, Master of Oxford’s Balliol College, sought her opinion on his translations of the Greek philosopher Plato. Florence’s mother ensured her daughters had the social skills required of upper-class girls: there was always another dance, or dinner party, or weekend in the country to look forward to. Florence tired of the social scene; she wanted greater meaning from her life. Aged 16, she believed God had called her to service. Between the ages of 17 and 19, her parents took her on another Grand Tour, delaying the day she could follow her calling. Aged 19, and opposed by her parents, Florence undertook a serious study of mathematics and engaged a tutor to help her. The 1840s were harsh years in the United Kingdom, with high unemployment. Florence Nightingale, now in her twenties, refused to ignore the suffering she saw around her. In 1843, aged 23, she started making home visits to help poor people. The following year she started working in hospitals. Her parents thwarted an attempt she made to train as a nurse at Salisbury Hospital. In 1849 she exasperated her parents again, this time by rejecting a proposal of marriage from Richard Monckton Miles, a social reformer. Nightingale recorded in her diary that her nature had three needs to be fulfilled: intellectual, passionate, and moral. She found him suitable on the first two points, but not the third. To escape the strife at home, friends took her on vacation to Germany. Defying her parents, she lived in a hospital, Kaiserswerth, observing the treatments offered there. She wrote a 32-page paper recording her observations, which she published anonymously in 1851. At home, things were terrible. Florence was now over thirty years old. Her sister was jealous of her independent spirit and her intellectual friends. Her mother scolded her for not becoming a lady of society, spied on her, opened her mail, and prevented her seeing some of her friends. In 1853, aged 33, Florence Nightingale escaped. She got a job in London in charge of an institution caring for sick women. Her father had realized how unhappy the restricted life she led at home was making her. He secretly began paying her an allowance of £500 a year – enough for her to be comfortable and independent. On hearing she was leaving home for London, her mother wept and her sister became hysterical. Nightingale was a formidably efficient organizer. In her first post in London, she completely transformed the hospital regime. She had hot water piped to every floor and lifts installed to transport hot food quickly. She introduced quality inspections of bedding, equipment, and food, and made sure these were purchased on the best terms. She made sure the food served was nutritious. Within a few months, she replaced most of the existing hospital staff with people who were more enthusiastic, competent, and caring. Nightingale’s reputation for making dramatic improvements to healthcare spread quickly. In October 1854, the British Government asked Nightingale to travel to Scutari, near Istanbul, in Turkey and take full charge of nursing there. Britain, France, and Turkey were at war with Russia. British soldiers were dying in greater numbers in the hospitals and of cholera than on the battlefield, and the public had been enraged by scathing newspaper reports of the appalling situation. Nursing was looked on as a disreputable job undertaken by rather dreadful women who drank hard liquor. Nightingale wanted to change that. She agreed to the government’s request and was given the power to select the nurses she would take with her. They would have to be emotionally strong women, prepared to live in the toughest conditions and work with distressing cases and wounds. Nightingale took a team of 38, consisting of 14 hospital nurses, 14 Anglican sisters, and 10 Roman Catholic nuns. When they arrived on November 3, 1854, Scutari was like hell on earth. It was seething with filth, decay, disease, death, and men in a pitiful state, covered in fleas and lice. Wounded soldiers were having limbs sawn off without anesthetic, unscreened from other patients. Huge numbers of new casualties were expected imminently. Remarkably, the doctors at Scutari did not want any help from Nightingale’s team. Rather than argue, she decided to put her nurses on standby and do nothing. Assessing the situation and considering the impact of a new influx of casualties, she expected the doctors would ask for help soon enough. And they did. Nightingale had to fight against three squabbling government departments to implement improvements at Scutari. Things improved, albeit too slowly for her. Nightingale was idolized by the soldiers, who could see she was working herself to exhaustion to care for them and improve their lot. During her first winter at Scutari, 4,000 soldiers died. Nightingale ensured no soldier died alone. She was personally present offering comfort at 2,000 deaths. Gradually she made improvements to the bedding and the cleanliness of the hospital, constantly battling against resistance from the doctors. The lady with the lamp – Nightingale exhausted herself walking around the wards in the dead of night, caring for the soldiers. The soldiers adored her. Despite her selfless devotion to the soldiers housed at Scutari, and the legend that grew around her as a nurse, it’s important to remember that Nightingale was not really a nurse. She was a scientist, a data-gatherer, a writer, a trainer, a manager, an organizer, an analyst, and a campaigner; these varied skills, combined with an enormous appetite for hard work and a driven personality characterized her professional life. The government was energized to send a Sanitary Commission to Scutari in March 1855. This resulted in the repair, cleaning, and ventilation of sewers; installation of ventilation shafts; increased spacing between patients; site drainage; removal of open toilets; installation of a system to flush the drains several times daily; and the walls of wards being washed several times daily with lime. The death rate at the hospital at Scutari fell from over 50 percent in Nightingale’s first weeks to 2 percent. She recognized the crucial importance of the Sanitary Commission’s work in bringing down the death rate and she resolved to implement better sanitation wherever she had influence. Nightingale was physically and emotionally drained by her work, and became ill with fever. She was probably infected by brucellosis in milk. Undiagnosed at the time, this disease, with its attendant debilitating spondylitis, affected her for the rest of her long life. At times the spondylitis would cause her such agony that she could not move. Much of her future statistical analysis and campaigning would be done from a couch or bed. Nightingale took a holistic approach to the health of soldiers in Turkey, an approach she would follow for the rest of her life. She saw that soldiers in hospital were badly fed, and used funds generated following newspaper publicity for her work to buy the soldiers better food. Against the wishes of the Army officers at Scutari, who said it would be bad for discipline, she equipped the hospital with a reading room, where soldiers could find books and newspapers for mental stimulation. This was very popular with the soldiers and there were no discipline problems. Seeing for herself that excessive alcohol consumption was a problem for many of the healthy soldiers, she researched the issue and learned there was no system in place for soldiers to send money home. She started a money transfer system, with the result that the solders began sending large amounts of money home rather than consuming it the form of alcohol. She set up a popular coffee house as an alternative to alcohol. She was not, however, a puritan. She thought it would be a good idea if soldiers would drink less, but nuns drink more! By now Nightingale’s mother and sister were basking in her reflected social glory and had become enthusiastic about her work. Nightingale herself, however, had no wish for celebrity. After she heard large numbers of people were going to give her a rousing reception when she came back from Turkey, she traveled as Miss Smith and arrived home quietly. She refused to make public appearances. She was in fact privately grief-stricken for all the thousands of men she had tended to and seen die in horrible circumstances in Turkey. She also felt guilty that many of the deaths from disease had been preventable, if only she had known more about the importance of strict sanitary practices. The grief and guilt would stay with her forever, increasing her determination to prevent suffering wherever it was found. In 1859, Nightingale completed her book Notes on Nursing, the founding work of modern nursing. She set up the Nightingale Fund, raising enough money to establish the Nightingale Training School at London’s St. Thomas’ Hospital in 1860. Nurses would now be medically trained to care for patients: nursing would become a respected profession. Nightingale’s book covered hospital sanitation and design, highlighting the features that worked best. She showed how statistics should be gathered to best assess outcomes of ward practices and surgical practices. Linda Richards trained at the Nightingale Training School in 1877, and then returned to the USA, where she established high-quality nursing schools across the country. In 1859, Nightingale was elected to the Royal Statistical Society – its first female member. She utilized her mathematical training to analyze the causes of sickness and death, first in hospitals and then in broader society. She popularized the use of polar area diagrams to ensure the points she was making could be understood by politicians and civil servants – from experience, she did not trust these people to read reports properly. She often won arguments about the best way to proceed in healthcare through her mastery of statistics. From her experiences in Scutari, she advocated sanitary reform for the British Army in India, which reduced the death rate from 69 to 18 per 1,000 within a decade. In the UK as a whole, sanitary reforms advocated by Nightingale – compulsory sanitation in private homes for example – and supported by her statistics and polar charts are largely credited with improving average life expectancy by 20 years between 1871 and 1935. One of Nightingale’s polar charts (digitally enhanced). Even a politician can read this to see that, as time passes, the number of deaths per month is getting smaller. The colors show the cause of death. Nightingale had a number of male admirers, and during her life received at least two proposals of marriage. However, she believed God had chosen her for her work, and she never married or had children. She retained a lifelong affinity with the city she was named after, and loved to speak Italian and would use Italian words and phrases while speaking English with friends. She loved music: her favorite composer was Mozart. 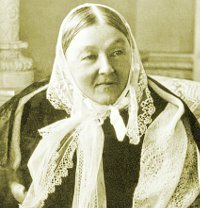 Florence Nightingale in her later years. From 1857 onwards, Nightingale was often confined to bed by spondylitis pain or depression caused by brucellosis. Despite this, she managed to achieve a seismic shift in the UK’s sanitation and public health programs, using her reputation to push politicians and officials into action. In 1883, she received the Royal Red Cross from Queen Victoria, who deeply admired Nightingale’s work, and invited her to speak with her on several occasions. In 1907, she became the first woman to be awarded the Order of Merit. From about the age of 70, Nightingale slowed down and became less driven, spending more time enjoying the company of friends. In the last 10 years or so of her life, she lost most of her eyesight and became somewhat senile. Florence Nightingale died in her sleep in London on August 13, 1910. She was 90 years old. She had been offered burial alongside some of Britain’s greatest heroes in Westminster Abbey, but turned this down. She actually requested her body be used for medical research, but this did not happen. She was buried quietly, beside her parents, in the graveyard of St Margaret’s Church near her childhood home of Embley Park. There was a huge service in her honor at St. Paul’s Cathedral, attended by the King. A choir of 1,000 nurses sang at it. Florence Nightingale was revered in her lifetime and is still revered today. "Florence Nightingale." Famous Scientists. famousscientists.org. 15 Aug. 2016. Web.